Centier Bank is committed to making Elkhart, and Elkhart Public Library, better. The family-owned bank’s most recent collaboration with EPL was a book giveaway at their new Elkhart location, at 2809 Emerson Drive at C.R. 6. 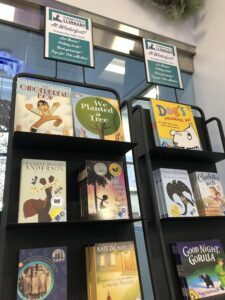 “We bought 400 books for children of all ages and they can come in, get a snack and pick out a book,” said Sheila Sieradzki, vice president for community relations at Centier. According to Sieradzki, this is the third collaboration between Centier and EPL, which started with the Top 5 Tuesdays financial classes in February and continued with the Empowerment Crocks series, which involved the United Way of Elkhart County as well, in August. The free programs that Centier has done with the library and United Way show the bank’s commitment to the local community, Sieradzki said. She said that Centier will also be opening a branch in downtown Elkhart next year, giving them a presence downtown to go with their commitments through service. “We’re planning a downtown Elkhart location to be opened in summer of 2019,” she said. Looking ahead, Sieradzki said that EPL, United Way, Next Level Improv and Centier are again collaborating on the “Body, Mind and Soul” program set for January. Details will be coming soon.